Hi, I'm a new user and this program seems like the best fit for me as I have a lot of audio in MP3 and FLAC that I wish to simply play from a long established collection. 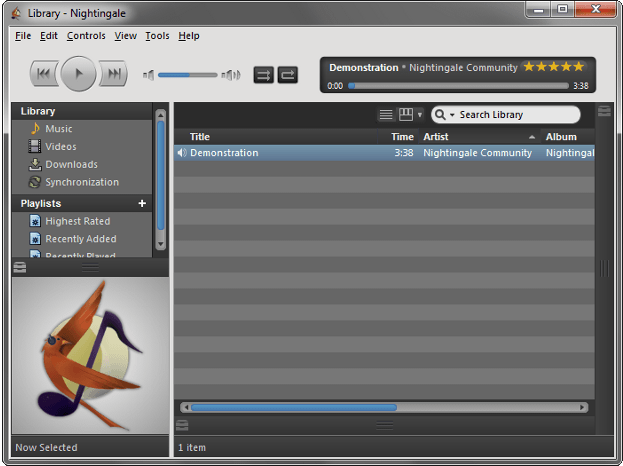 I have tried Nightingale and have downloaded some add-ons, including grid view and Media flow. In concept these seem great and intuitive, however when you click on an album cover image, it only plays the first track. For that matter, when I am in the regular list view, it only plays the first track when I click on it. I have used many other media players on Mac and Windows and when you play the first track, it just keeps going with the next tracks. What do I need to do to enable this? In theory nightingale should behave exactly the same. Could you look at Extras -> Error Console after traying to play an album? Do you get any error messages as popup when it tries to advance? Is the player in continuous mode (the two buttons to the right of the forward button are like on this screenshot)? (08-28-2015, 08:41 PM)freaktechnik Wrote: In theory nightingale should behave exactly the same. Could you look at Extras -> Error Console after traying to play an album? Do you get any error messages as popup when it tries to advance? Is the player in continuous mode (the two buttons to the right of the forward button are like on this screenshot)? Turns out it was the "now playing" add on that was causing some weird behavior so I got rid of it. The basic playback of the next tracks in the library now works as you would expect. Thanks. Does anyone use the "grid view" add on? It does a form of bundling of albums by the same artist. It would be useful to be able to select from these albums, or alternately, upon first click for the display list to navigate automatically to those tracks. Any tips? Thank you very much. (08-29-2015, 12:13 AM)on_board Wrote: Does anyone use the "grid view" add on? It does a form of bundling of albums by the same artist. It would be useful to be able to select from these albums, or alternately, upon first click for the display list to navigate automatically to those tracks. Any tips? Thank you very much. When you click an album pile from the grid, it should filter the display list underneath it to show only tracks by that artist. There's actually an issue with the add-on where the filtering won't work if you switch from the the Filter Pane View (and possibly other media views installed via add-ons) directly to the Grid View. Try switching to the List View, and then directly to the Grid View. (08-28-2015, 04:55 PM)on_board Wrote: Hi, I'm a new user and this program seems like the best fit for me as I have a lot of audio in MP3 and FLAC that I wish to simply play from a long established collection. I have exactly the same problem, it only plays them the first track, I then disabled all add ons and it could play all tracks. 1. I installed Nithingale on Mint 17.2 using GNOME/Unity integration | Linux Tarball (.tar.bz2) | 64-Bit . Perhaps this download does not suit mint. May I have the link to download nightingale for Mint? 2. Codecs. is there any mean to buy the missing codecs? That should be the correct tarball, alternatively you can use the build from the ppa, see the bottom of http://getnightingale.com/all-versions.php. Also, as on_board wrote, it seems this is an "issue" with the now playing list 2 extension, I assume.